2.30am – the middle of the night, Bodmin Moor, Cornwall: the descent towards the A389 seemed perfectly innocuous, until my light cut out abruptly, leaving me in complete darkness. Blacker than black. Time slowed down. I told myself that this sudden complete lack of visibility didn’t matter: I just needed to remember where the road had been going, hold my line accordingly and stop as quickly as possible. Somehow I managed it, but as adrenaline rushes go, it was a significant spike! I waited, stationary, to let my eyes adjust to the darkness and then rode slowly for a couple of kms, to my next rendezvous with Ross and the support car. I was now deep into Cornwall – my final county of eight, but the one that seemed to be going on forever. 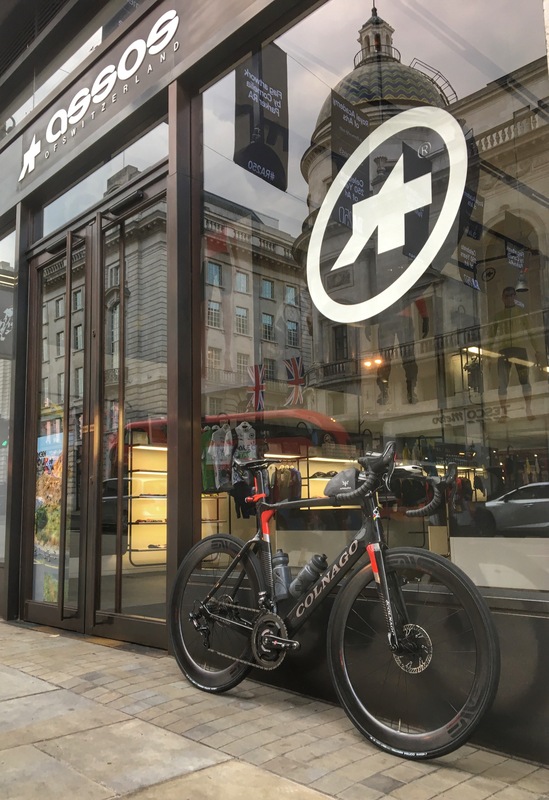 I’d left the ASSOS ‘mono-brand’ store in central London, almost 24 hours earlier, with the aim of riding all the way to Land’s End in a single push. 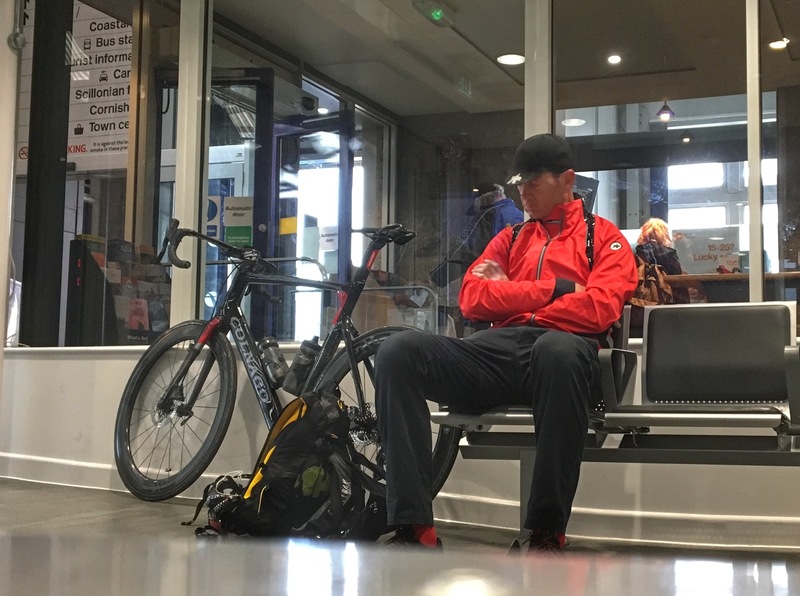 I wasn’t part of an event, nor riding for charity – I just wanted to see if I could do it – and I’d self-imposed just one rule: no sleeping. At 530km and with c.5,800m of ‘up’, this ride was going to require a very significant effort. I’d been toying with a ‘500km in one go’ attempt for at least a couple of years, but hadn’t really alighted on a route. The obvious course would be flat. 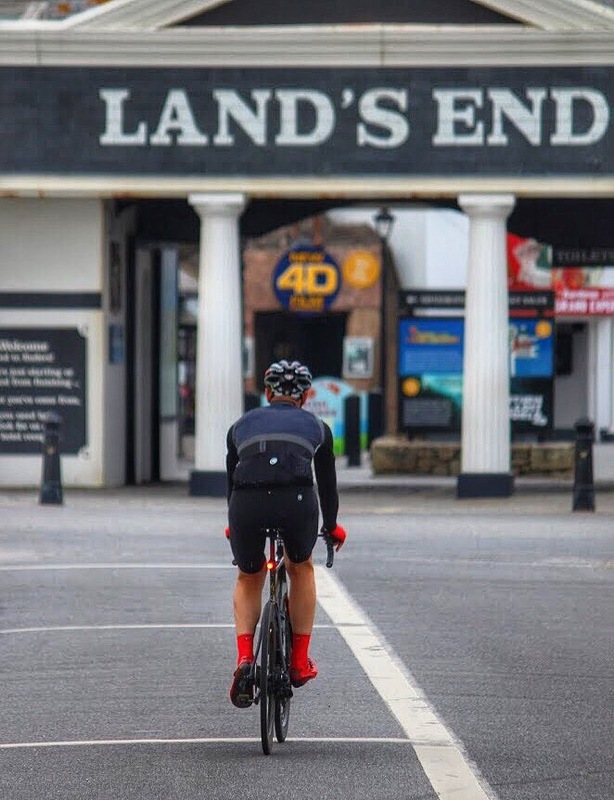 But then, in late 2017, ASSOS of Switzerland asked me to prepare and guide a four day route from Land’s End to their London store for a small group of customers and a spark ignited, somewhere deep down in my subconscious. 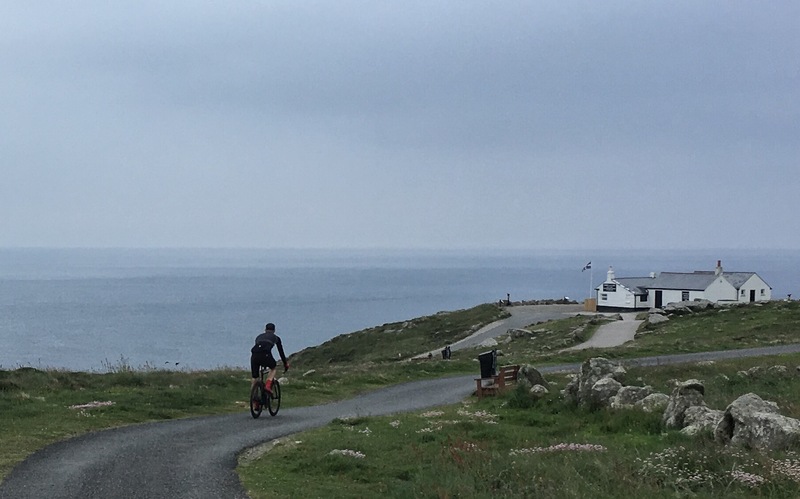 With the four day customer ride scheduled for late June, I started to ride parts of the route, notably the section from Land’s End to Exeter, which I perceived as the hardest, both in terms of avoiding main roads and also the cumulative amount of climbing that I was likely to encounter. 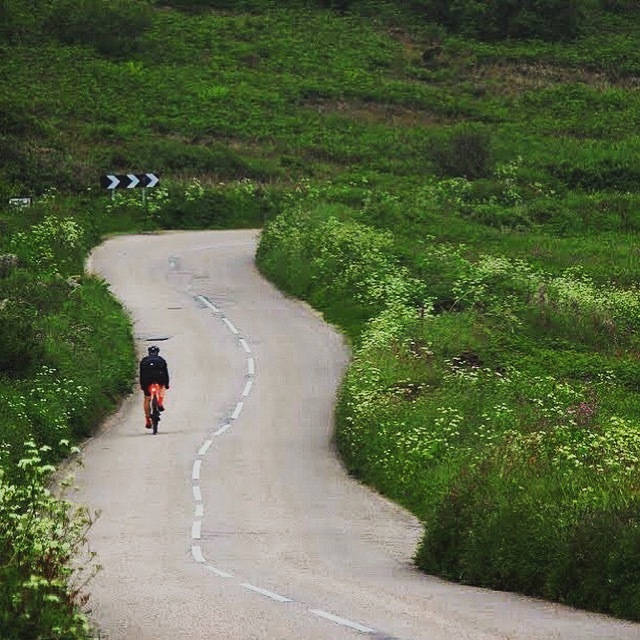 It made sense to ride that part first and finish in London – the final 100km or so were virtually flat. By late May, I had a final version of the route, but I couldn’t really get my head around the logistics, notably how to get safely into London, when tired and possibly coinciding with rush hour. The second issue was support: I’d have to ride through the night and that would mean difficulties finding food, water, recharging lights etc. I felt physically ready to go and knew that my time window was limited to the following week, after which other commitments would rule out an attempt, indefinitely. On Wednesday 30th May, I checked the forecast for the week ahead: fine weather, but a north-easterly wind. No go. But then it suddenly dawned on me: why not reverse the route? Monday 4th June looked like the best day. There was one huge upside to this approach: if I was prepared to leave London really early, I could completely avoid the traffic issues. 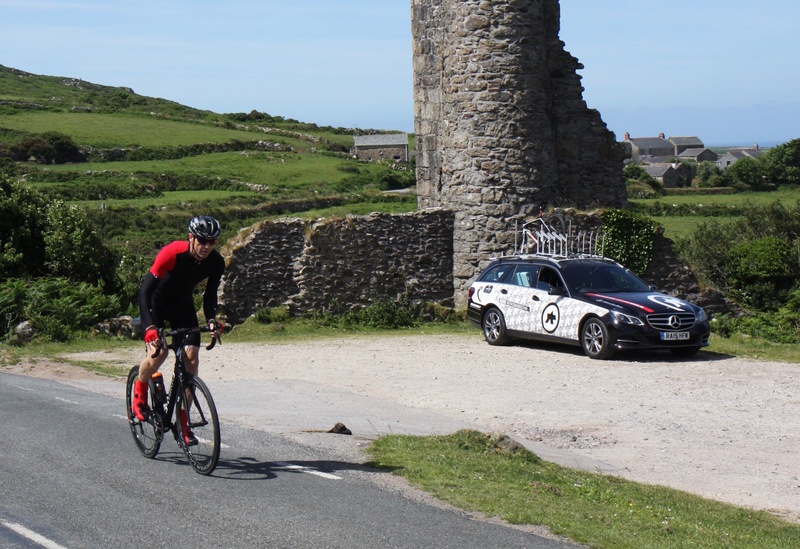 The downside of course was that I would then hit the hardest part of the ride – the final 220km through Devon and Cornwall – at the end and at night, which would be really challenging. My head was saying ‘stop’ and my heart was saying ‘go anyway’. As always, committing to try was almost the hardest part. 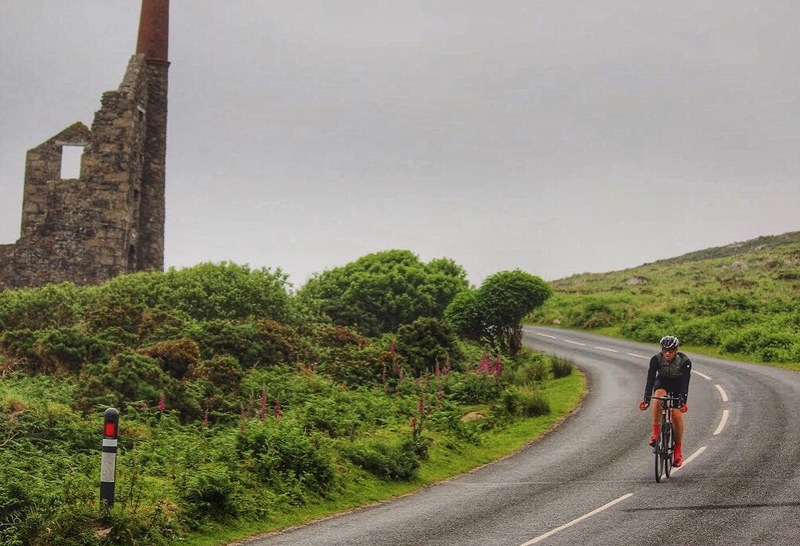 Without really expecting a positive answer, I fired off a quick email on Thursday to Ross Lovell of Moor Retreats – a luxury bike tours/retreats guiding company, based on the edge of Dartmoor and who I knew only from following him on instagram: “you don’t know me, but would you consider giving up a night’s sleep on Monday and supporting my ride”. Somewhat remarkably, he replied overnight and said yes! I couldn’t quite believe it. I still can’t. What an absolute star! I sent him a link to my route, asked for his views on my choice of roads and also mailed him a parcel with spare clothing, energy food, spare lights and wet weather gear (the forecast was now saying possible thunder storms, late in the day). In theory, all I needed to do now was relax over the weekend and head into London, late on Sunday afternoon. Fate however, had different ideas. I headed out for a gentle 60km on my S-Works Roubaix on Saturday morning. It was the perfect bike for a ride like this: fast enough on the first 330 km to Exeter (Zipp 303s), long-distance comfy, great gearing (34×32) for the final 200km and very familiar (my ‘go to’ bike since 2014. Half way round, I noticed my finger felt sticky and a quick glance showed that it was covered in oil. Uh oh. It turned out that the hydraulic cable had sprung a leak and the bike needed a complete new lever. In the time left before departure, this was impossible. Every option flashed through my mind: don’t go: not an option. Take the Litespeed: not ideal. Take the OPEN: great gearing for the hilly bits later in the ride, but not fast enough. Rebuild my old S-Works Roubaix: smart idea. But… there was one other choice: take the new Colnago: like the ride itself, my head said no and my heart said yes. I’d only taken delivery of the Colnago a few weeks earlier and had ridden just 450km on it at that stage. It was a Colnago Concept – an aero bike. It was stiff and the riding position was pretty aggressive, as was the gearing. I’d bought it for short, fast rides and possibly even crit racing. It categorically wasn’t designed to be ridden all day, let alone for c.24 hours! My head told me this was probably the wrong bike to take, but my heart won. My heart won and I put the Campagnolo EPS groupset and the SRM power meter on charge. I made two other small changes: I added a 10mm spacer under the bars to help my back cope with the position and I changed the tyres to Vittoria’s 25mm Control version, which I perceived as fast, but with slightly tougher protection against punctures. 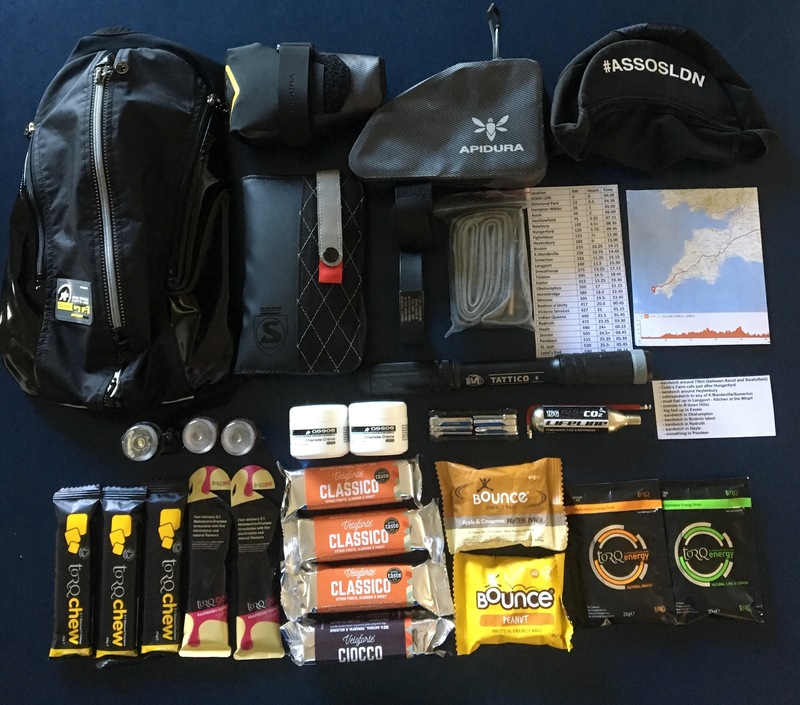 I planned to carry very little with me: a couple of small battery packs, some energy food and electrolyte mix, one set of lights, the usual spare tubes (three) and tools, knee and arm warmers, a cap and a very thin wind jacket. The forecast was good, so I didn’t need anything more. 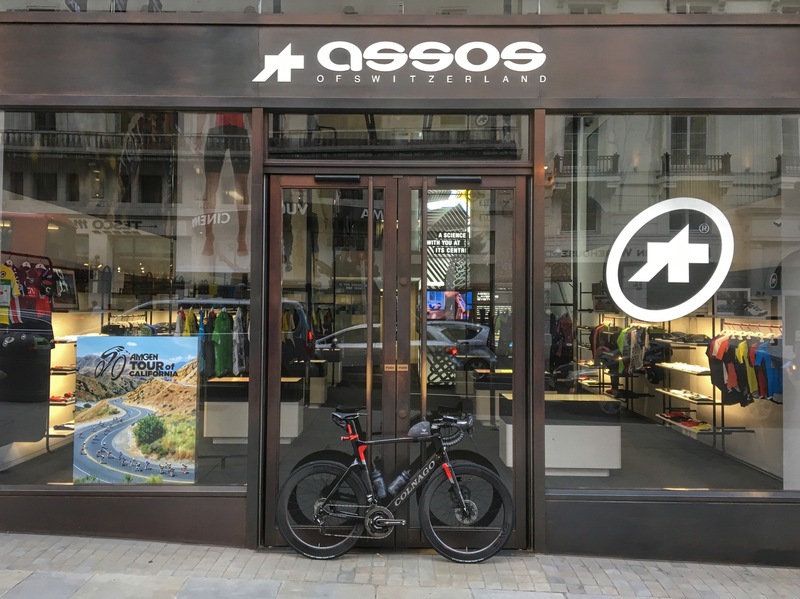 I made my way into London late on Sunday, took a couple of pictures outside the ASSOS LDN store and then headed off to bed with all the familiar feelings of apprehension, mixed with anticipation. 3.00am: the familiar, annoying sound of an Apple alarm. I snoozed for a couple of minutes and then dragged myself out of bed. It was a mild night, so I added arm warmers, but left the knee warmers in my pocket. I ate a bowl of cereal, made a cheese bagel for an hour or so down the road and at precisely 3.50am, I rolled past the ASSOS store without stopping, through Piccadilly Circus and pointed my front wheel towards the west. All adventures have to start somewhere and this was the perfect place. London was still cloaked in darkness, but there were already cars on the road and even the odd bus! I’d expected it to be quieter and was thankful for my lights. 4.25am: Richmond Park: the Roehampton Gate was locked, which had never occurred to me! I cursed myself for not having thought about this, but then discovered the small wicket gate and entered the park. I had it entirely to myself, along with the deer and a few rabbits. I rolled through and snapped a few pictures on my phone as I went: Richmond Park all to myself was pretty damn novel! A crescent moon still showed in the sky, but I could now see without lights. Dawn had arrived. Without knowing it, while removing my phone from my pocket, I’d dropped my ride notes – a small laminated card which named all the towns along the way, with distances and likely timing between them, along with notes on where I should categorically find food and water. On rides like this, where the ‘whole’ is just overwhelming, I’ve found it best to break things down into manageable chunks. For example, at this point, I still had 515km to ride, but Ascot was only 35km away. So I focused on Ascot, rather than Land’s End. When I discovered the loss, an hour later, I was momentarily thrown. 4.35am: I couldn’t get out of Richmond Park. My intended exit via Ham Gate wasn’t happening: both the main gate and the side gate were locked. What a farce! 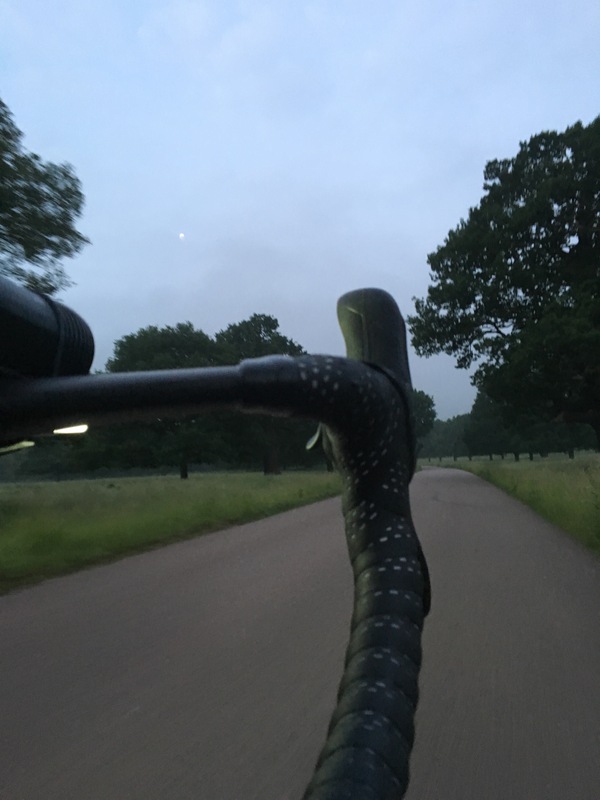 I was potentially trapped in Richmond Park, half an hour into the ride and with the clock ticking away re’ pressure to escape London before the Monday morning rush-hour started. I turned back up the hill, in the opposite direction to Land’s End and rode to Kingston Gate instead. To a huge sense of relief, the side gate was unlocked and a few minutes later, I was back on route. 5.00am: Hampton Waterworks, bang on schedule. Signs said the road ahead was closed, but I took a chance and got lucky – the huge hole was passable on a bike! 5.30am: Chertsey: traffic was slowly building but I was making good progress, not stopping at all. I passed under the M25 and headed due west towards Ascot. 7.00am: Ascot, still right on schedule. I took my first break, refilled my bottles at a small shop, tweaked my saddle position slightly and ate the bagel I’d made earlier. I was still running blinker lights and decided to keep them on until Hungerford, around the 120km mark, which was where I planned to take my first proper feed stop. 8.15am: the outskirts of Newbury and the surrounding roads were really busy – this was definitely the school and work rush. I managed to filter past the delays and headed back onto quiet roads, still heading due west towards Hungerford, catching crosswinds and the occasional headwind. 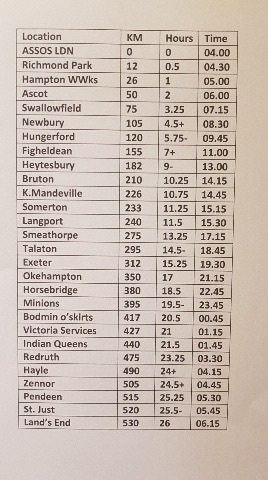 9.00am: Hungerford, still on perfect schedule. I missed the cafe I’d planned to use and was out of the town before I realised what had happened. This was a key point in the ride: I’d now turned south-west and could enjoy the full impact of the NE tailwind. I knew I’d find a garage or shop somewhere up the road, so just kept rolling along at c.35kmh, marveling at the scenery, the ease with which my bike was eating up the miles and the noise the deep section enve rims were making! The section that followed was one of the best 150km of riding I’ve ever had. One of the best 150km sections I’ve ever ridden. 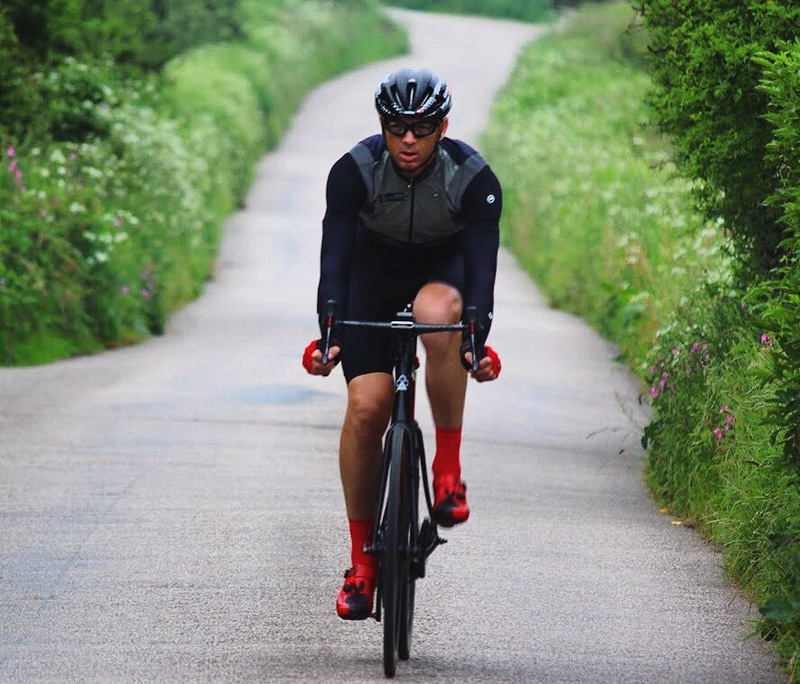 9.45am: Collingbourne Ducis: I stopped at a small shop to fill my bottles and ate a banana, a Veloforte bar and stockpiled a flapjack for later. The man behind the counter asked me where I was going and then looked at me disbelievingly when I told him! 10.30am: Knowing that I really needed some proper food, I stopped at a small cafe in Larkhill, very close to Stonehenge and ordered a bacon sandwich and a double espresso. They both tasted wonderful. 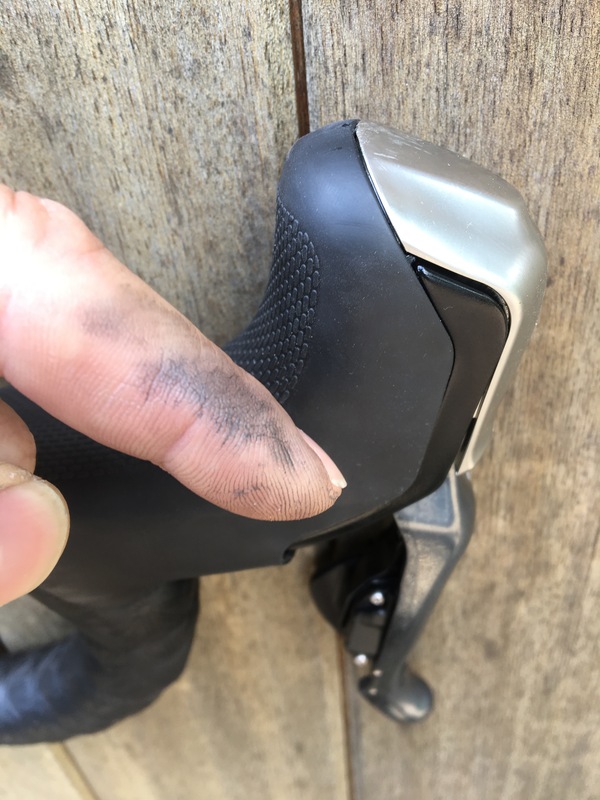 Any stoppage time was a chance to recharged one or other Garmin (I was running two, in case one failed), but to my dismay, I discovered that the recharger didn’t work – sweat from my Stwlan Dam Everesting in April probably being the cause. I threw it in the bin and used my spare phone battery pack instead. I knew I could reach Exeter and Ross before I would need any more power than I had with me, so there was no need to panic. I called home and my son Jack photographed the itinerary that I’d lost in Richmond Park and texted it to me. I saved it as the wallpaper on my lock screen and instantly felt back in control of the ‘pieces’, rather than the ‘whole’. I was genuinely thrown, having lost this ‘chimp management aide’ in Richmond Park, but my son Jack sent a copy to my phone and I was back on track after that. My amazing progress continued – fast easy riding across beautiful landscape. Longbridge Deverill: I refilled my bottle again and ate a sandwich. Bruton: my routing took me down a barely ride-able lane and I was lucky to avoid punctures. 1.20pm: Castle Cary – with 212km, at an average speed of 28kmh! I was now deep into Somerset. It was lunchtime, so I stopped for cake and another espresso, but was saving a proper feed-stop for Lang port, which was another 30km up the road. 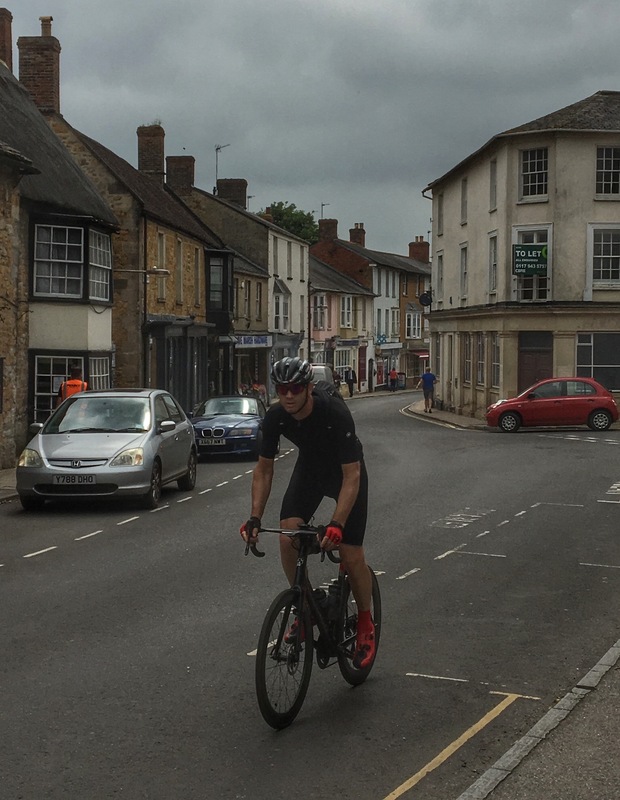 Castle Cary: 212km and not even half way! 3.00pm: Langport: my first choice of cafe had closed, but the second was great and an espresso and sausage sandwich were both wonderful. I refilled my bottles yet again and drank plenty of water, knowing that the next 70km might be devoid of options to refuel: the Blackdown Hills. This is an amazing hill range – it’s as high as Dartmoor, very remote and barely ever talked about. I’d been looking forward to this part all the way down to Langport – it’s always fun exploring a new area. My tailwind continued to aid my progress, but the day was now hot (at 28.C) and humid. There were four major climbs/uplands on my route, each one harder than the last. I’d already crossed the Cranbourne Chase/Salisbury Plain, but the Blackdown Hills presented a harder climb and the first point at which I might really question my choice of bike. Up until this point, the bike had actually been perfect – slightly rigid perhaps, but seriously fast and perfect for the open, rolling roads. So, I was pleasantly surprised that my 36×29 was adequate, even though the climb had long sections at 16%. Once on top, I found a long plateau, quiet roads and very little else! I just kept rolling, watching the sun move across the horizon from left to right. Exeter arrived around 6.30pm and I realised that I was in need of an immediate refuel, so even though I was about to meet Ross, I stopped at a corner shop, refilled my bottles and ate another sandwich! 7.00pm: The next section really surprised me: marked on the map as just a local ‘yellow road’, the reality was a wide, open, fast-looking stretch of tarmac. I tapped away, heading for Tedburn St. Mary and it dawned on me that this used to be the A30, before they built the dual-carriageway that now carries everything but the local traffic. Sure enough, a little later on, I recognised a set of corners that my sister and I had driven, some 35 years earlier! 7.30pm: right on schedule, I pulled into the car park of The Traveller’s Rest in Tedburn and met Ross. He’d arranged a rendezvous at a pub and as we waited for my Garmins to fully recharge, I took my first real food break, devouring a bacon cheeseburger and chips as we chatted about the ride, the night to come and how frequently we should aim to rendezvous. Heading onto Dartmoor as the sun set. 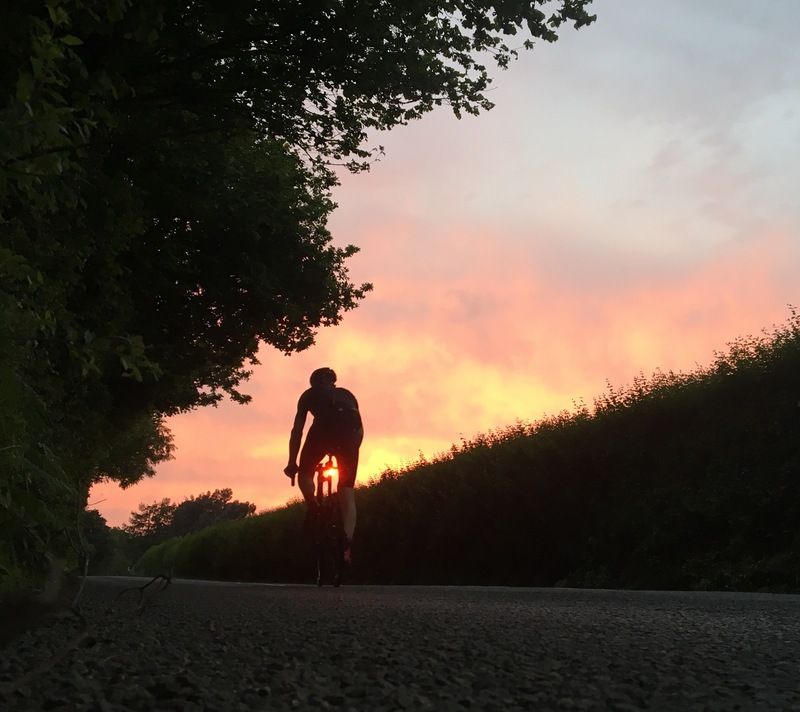 8.15pm: I rolled away, heading across the northern edge of Dartmoor, as dusk arrived and the sky briefly glowed pink and orange. By the time I reached Okehampton, it was pretty much dark. Behind lay 350km of road, but ahead lay the tough bit: two moors, the most technical roads and darkness. I climbed up onto the traffic-free Granite Way and headed towards Lydford and my next rendezvous with Ross. Somewhere around midnight I crossed into Cornwall and shortly afterwards, spent ten minutes in the passenger seat of Ross’s car, munching on cheese sandwiches and marveling at the fact that he’d agreed to get involved in such nonsense! Top lad. With Dartmoor firmly behind me, the final big challenge was Bodmin Moor. 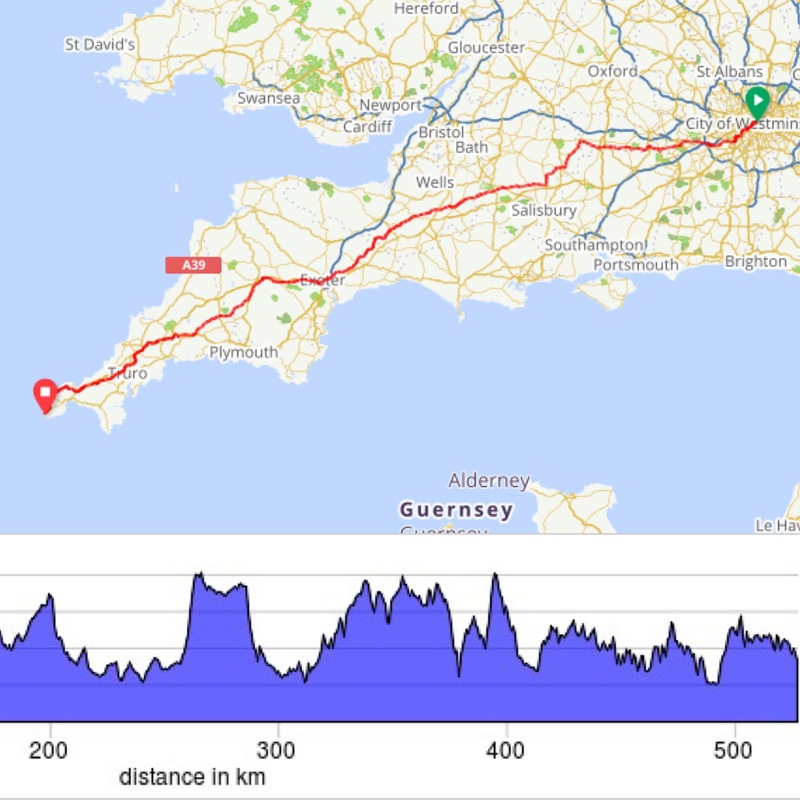 I climbed steadily up to Minions and then began the long drop to Bodmin, using the deserted A38 to make rapid progress (I’d never dare use such a busy road during daylight, but at 2.30am, I saw just one car). My next goal was Victoria Services and all seemed to be going fine, until my light cut out. I knew that the filling station would be open and sure enough, Ross had parked up in the best lit spot. As we fiddled to attach my spare light, the attendant walked outside and asked me if my bike was a Colnago Concept! I was stunned – the Concept is pretty rare and little known. At 3.30am, this seemed like a really bizarre question! He asked if he could help, invited us in for (free) coffee, put all my lights and Garmins on charge and generally behaved like the perfect host. Amazing. I lingered. It was warm inside and every minute lost here brought me closer to the safety of daylight. In the end, we paused there for almost an hour, drinking coffee and letting things recharge (nothing had really charged much in Ross’s car, so the offer of mains electricity was too good to refuse). 4.00am: I rolled away again, knowing that I should be able to see without lights within half an hour or so. I used my second ‘big road’ for a short section – the A30 – to make some rapid progress for 15km or so and then headed back onto quieter roads as I approached Cambourne. Getting close enough to feel confident. 7.00am: Cambourne. The world was waking up. I rode through Hayle and climbed up onto the peninsular. It was a grey morning, where the sky and the sea merged into one another, off to my right. The road to Land’s End should be downhill all the way, but of course this was Cornwall, so in reality, it was distinctly lumpy! Ross was never far away and snapped some great pictures as I did my best to keep my pace high, right to the finish. Abandoned tin mines: I’m definitely in Cornwall! 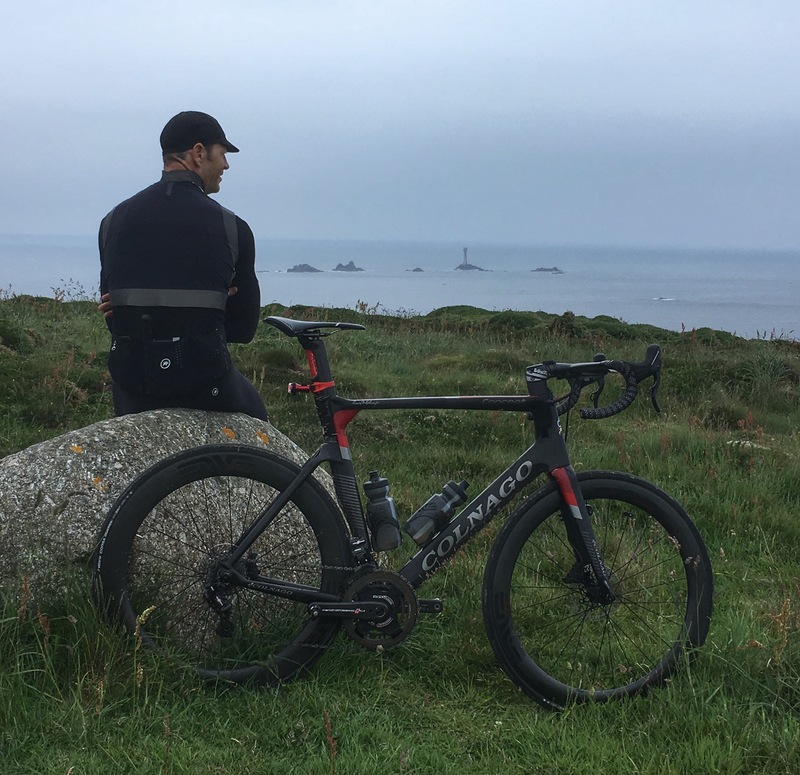 Somewhere around 8.30am and within 30 minutes of my theoretical timeline, I rolled across the finish line at Land’s End itself, so pleased and relieved to be done. Done and so glad to be able to stop! Ross and I headed slowly down to the ‘Last House’ and then, after a few pictures and short pause to take in what I’d just done, we packed up the bike and headed for Penzance and a rendezvous with a hotel breakfast! Ross headed off back home to Devon and I bought a train ticket for me and my bike, leaving at 2.30pm. I asked the hotel if they’d let me check in for a few hours and they did: I showered and slept for two hours. The 2km ride to the station was hard! Then my train was cancelled and I had to sit it out for the afternoon. They laid on a coach for the other passengers, but since I had a bike with me, I just had to wait. And then they asked me to leave the empty Waiting Room, because bikes weren’t allowed in it. I scowled and politely suggested the Station Manager was welcome to come and explain his reasoning. They left me in peace. Somewhere around 5.30, my train finally left Penance, this time with the massive bonus in that it included the Pullman Buffet Car. I booked in for dinner and enjoyed one of the best meals I can remember. With hindsight, this ride felt pretty much like an Everesting – fun for the first two thirds and then just hard work. I genuinely enjoyed the first 350km, but the final 180km, much of it in the dark, was ‘Type 2’ enjoyment. Three weeks later, I savoured every moment of the route, but over four days and in great company. It was much nicer, three weeks later, with time to savour the route, full support and friends to ride with! Thank you ASSOS for sewing the seed and crucially, huge thanks to Ross Lovell of Moor Retreats for looking after me through the night. If you ride far enough, in the end, there’s nowhere left to go!